Over 20 years ago, The Washington Post called me "A Kahlophile since age 17", and even after all these years, that description still fits me to a tee. 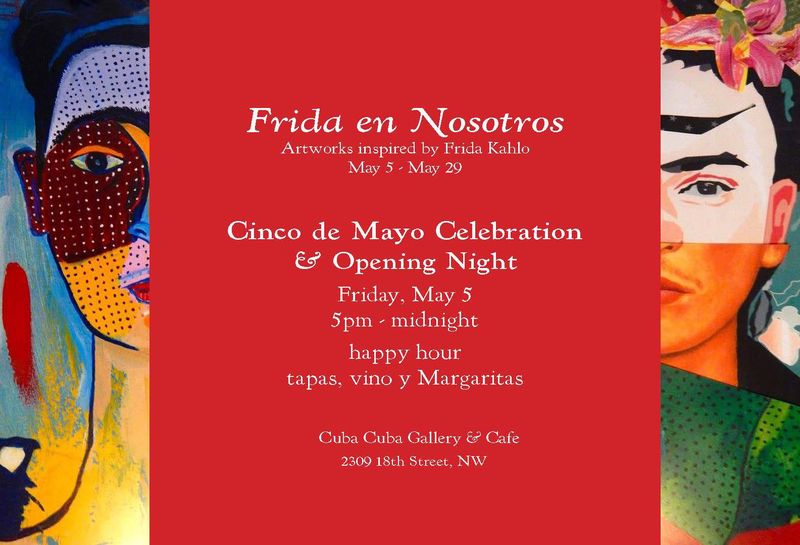 Subsequently, I was lucky enough to curate two (in partnership with the Mexican Cultural Institute for the first one, and with the same Institute and the Frida Kahlo Museum in Mexico City for the second) worldwide "Homage to Frida Kahlo" shows - the first one at Georgetown's iconic Fraser Gallery, and the second one online with art.com. Over the years, as documented here, I've done hundreds, if not thousands of works inspired, related or obsessed by Frida Kahlo, the Champagne Communist, pain-ridden lead for the title of most famous and influential Latin American artist... ever. And soon, very soon, I will be announcing another major Kahlo-related project... stay tuned! An artistic culinary initiative in Adams Morgan, where art, music and Spanish food traditions fuse into a cultural experience. Patrons can enjoy art exhibits in the restaurants' basement gallery space and then pair the experience with a good glass of wine and a variety of tapas or a dinner that samples Spanish and Cuban cuisine traditions.